We've got a few content updates in the KnowBe4 Modstore to share with you for the month of November! 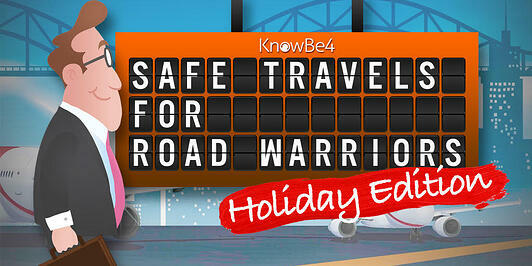 In the holiday spirit, a free interactive training course called Safe Travels for Road Warriors Holiday Edition for the 2018 Holiday season is available to help you stay safe while you travel. The module is 12 minutes in length and is available for access during November and December. Want to see the KnowBe4 platform in action? See a live product demo now! 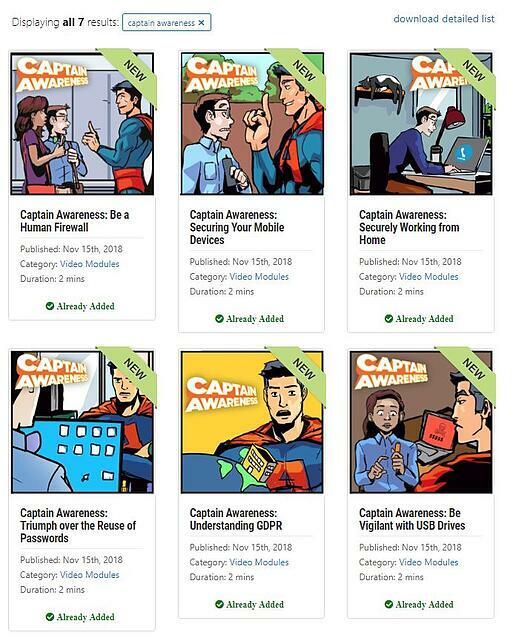 A new comic book style animated series called Captain Awareness was introduced with the release of the first 6 episodes. These two-minute modules cover topics such as: GDPR, Triumph Over the Reuse of Passwords, Securing Mobile Devices, Being a Human Firewall, Staying Vigilant with USB Drives, and Working Securely From Home. 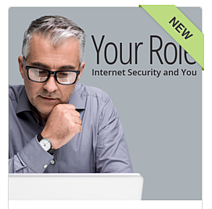 The new 2019 Your Role: Internet Security and You is now available. As one of KnowBe4's most popular courses, this course will be replacing the 2018 version. Your Role covers the threat landscape and every employee’s role in keeping their organization secure against these threats. Special attention is paid to social engineering because this is the tool cybercriminals use to trick users into taking an action that puts their organization at risk. 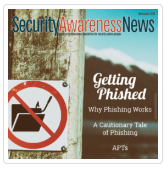 The November SAC Newsletter covers why phishing works via a real-life example, and highlights the obvious signs of an attack with a phishing identification checklist. Also, a new Security One Sheet, Holiday Headaches was added. A variety of training, posters, and security documents were added by Popcorn Training this month. In every organization it is important to have a business continuity plan in place should an emergency or incident occur. 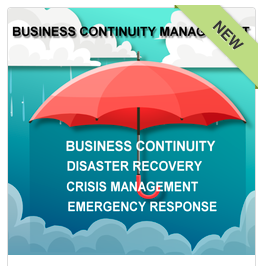 Business continuity management ensures that your business always remains in business. In this module, learn about what emergencies may lead to BCM coming in to effect. All Popcorn Training Security Docs and Modules are available at the Diamond subscription level. We're excited to welcome TeachPrivacy to the KnowBe4 content library! TeachPrivacy provides privacy and security training by the leading subject-matter expert, Professor Daniel Solove. TeachPrivacy excels in creating training that is engaging, memorable, and understandable. 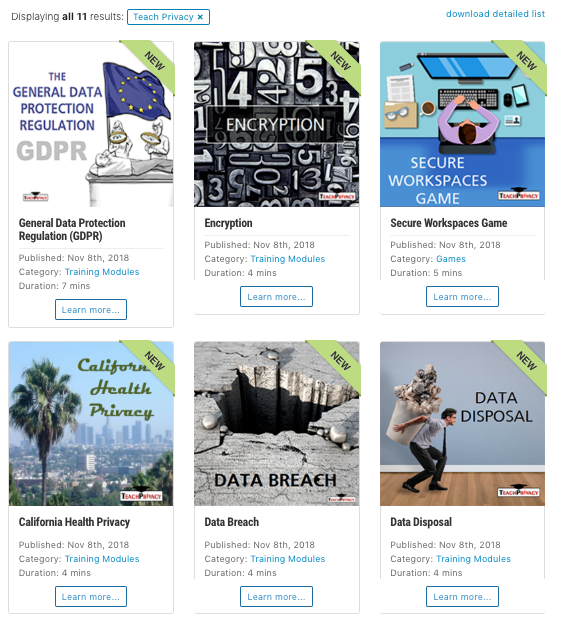 Ten new modules and a game that cover topics from GDPR, Data Privacy Best Practices, to Encryption, and more. All TeachPrivacy training is available at the Diamond subscription level. Want access to the most comprehensive security awareness training content? Take a sneak peak of the current KnowBe4 library with a free Training Preview.